Pirates of the Caribbean is a boat ride in Adventureland at Walt Disney World's Magic Kingdom. While it's not the best, it is also recommended. Walt Disney World's Pirates of the Caribbean opened in 1973, two years after the rest of the Magic Kingdom. Originally, Disney Imagineers had planned to build an elaborate "Western River Expedition" dark ride in the Magic Kingdom, figuring that Floridians would have no interest in a Caribbean-themed boat ride, since the Caribbean is practically next door. They were wrong. Disney World visitors demanded their own version of Pirates of the Caribbean, and Disney obliged. Walk through the Spanish fortress and step into a bateau for your ride into a mysterious cavern. Be sure to "keep your ruddy hands in board," though, for "there be rough seas ahead," ones that will drop you into a musical pirate adventure. The Magic Kingdom's 10-minute Pirates ride omits several scenes from the Disneyland original but retains its most famous moments, including the attack on the Spanish Fort, the auction, the chase scene, and the burning city. Not to mention X Atencio's and George Bruns' famous theme song, "Yo Ho, Yo Ho, A Pirate's Life for Me." 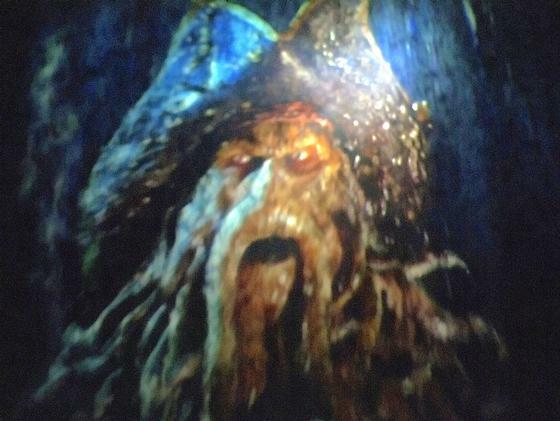 In 2006, Disney added Captain Jack Sparrow from the Pirates of the Caribbean films to the ride. Keep your eyes peeled — he appears in several scenes throughout the ride. If you're curious, the plans for Western River Expedition made their way into two other Disney attractions. Some of the scenes from that indoor boat ride were incorporated into the Phantom Manor ride at Disneyland Paris. And the roller coaster planned for atop the Western River Expedition "mesa" building evolved into Big Thunder Mountain Railroad, which you'll find just around the corner in the Magic Kingdom's Frontierland. Amazing and wonderfully themed attraction. The Disneyland version is 10/10. Because this one is only half as long, it gets a 9/10. Pales in comparison to the original at Disneyland, but always worth a visit. I always like to visit just to check if the prisoners ever got the key from that doggie, no luck the last time I was there!